Most of the L-Tronics Little L-Per units in the field today are the LH-16 version. That is, they are able to receive both VHF (121.5 MHz) and UHF (243.0 MHz) frequencies. How many times have you trained on the UHF band, however? If you're like most people, the answer is, "never." That means the very first time you might use UHF is on an actual search. Is that a good idea? Of course it isn't, so this page will give you some options to train in the UHF band. Currently, Civil Air Patrol does not have a UHF training frequency. As you may have learned elsewhere on this site, an effort is being made to make 243.55 MHz a training frequency. Why that particular freq? If you multiply 121.775 by 2, you get 243.55, or the 2nd harmonic of 121.775 MHz. As listed in the Practice Beacon Box project on the CAP ES Resources website is information regarding the suppression of this second harmonic on all of our practice beacons. It is important to note that while transmissions on 243.55 are suppressed, they are not eliminated. This means that you can DF your regular 121.775 practice beacon on 243.55 MHz. That is, if you have a 243.55 MHz crystal installed in your L-Per (or aircraft, for that matter!) The crystals can be ordered from L-Tronics. They are a special order and will take about four weeks. If you have the new L-Per (LL-Series) it is tunable to any frequency from 108-162 MHz (and some up to 174 MHz) and 215-270 MHz. You simply need to enter 243.550 and DF to your practice beacon. If you are using an LL-series in an aircraft, this same method will work. For other aircraft users, if you have the Becker SAR-DF-517 receiver, you can train on 243.55 MHz by changing the frequency in training mode. The manual will show you to do this. So if you have signal overload when you're close to your practice beacon, switch to UHF! You must also switch to the small antenna or your DF will not work properly. If you don't believe it, try it with the larger antenna. The little antenna is not just cute, its designed for UHF. Bruce Gordon, longtime CAP member and inventor of the Little L-Per, reports that the method of switching to UHF in an oversense situation is effective within about 100 yards or so. That could be perfect for a quick exercise on a meeting night. That way you can at least say that you've practiced on UHF! It is also important to know that ELTs and EPIRBs may malfunction and only transmit on one frequency--either 121.5 or 243.0. See the SAR Tales #21: One, Both, or None for an example of this. In this case, or in the case of a military UHF-only beacon, electronic searchers should be able to DF on either band. Is there a big difference? No, but there's enough to necessitate you getting some experience before you try it for real. Another avenue to explore is your local Air Force Base or Air National Guard Base. Get in contact with the Aircrew Life Support technicians there. They are in charge of maintaining all the survival equipment that goes on an aircraft. 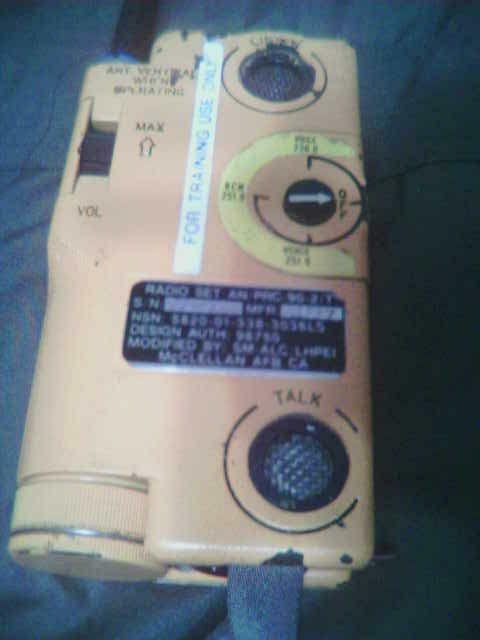 A required item in every Air Force survival kit is a search and rescue transciever (2-way radio). The most common radio in the United States right now is one of several versions of the PRC-90 radio. The PRC 90-2 radio is seen to the left. These are very tough radios--the outer case is metal and they're waterproof. They were designed to withstand the rigors of Vietnam, but only saw limited service there. Your local Life Support shop may let you borrow one, but don't lose it! Replacement cost is somewhere in the neighborhood of $2500. If you would like very detailed information on the PRC-90, check out this link. 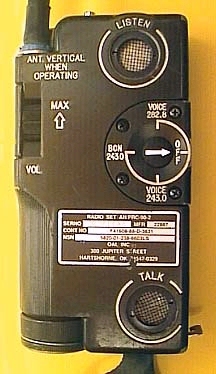 The normal PRC-90 radio has 3 basic modes of operation. It can transmit a beacon on 243.0, called military "guard" channel. This beacon sounds like the familiar ELT swept tone. Another mode is operation on voice on 243.0 MHz, and the last mode is voice on 282.8 MHz. You can see each of these frequencies printed in the picture on the left. The radio is very rugged and very simple. This is why the radio is able to survive the rigors of ejection and combat. Your local Life Support shop also will also probably have a small supply of training-use-only PRC-90 radios, called the PRC-90T. They are supposed to be painted yellow. Every Air Force aircrew member is periodically required to undergo currency training as a survivor in search and rescue operations. While doing this, they will utilize training frequencies. Of particular importance to a survivor is vectoring an aircraft. The survivor gives the aircraft headings based off of his or her compass and visual or sound contact with the aircraft. As a CAP aircrew member, are you ready for that? Could you follow a survivor's vectors? Think about it. The training PRC-90 radios operate on different frequencies than the actual radios for obvious reasons. The beacon/voice frequency is 251.9 MHz and the voice-only frequency is 236.0 MHz. There isn't too much training value in 236.0, but if you were to buy a 251.9 MHz crystal then you could easily train with these Air Force personnel. More than likely, you will teach them something! You will find that many of these life support shops that have Little L-Pers but have no idea how to correctly use them. Because 251.9 MHz is too far away from 243.0 MHz, you will receive some attenuation with the Little L-Per. This means that the unit will not be able to receive from as far of a distance as it would with 243.0 MHz. This should not matter for training operations. As a side note, the PRC-90 has been deemed too easy to find in combat. Because we don't want bad guys to DF to the survivor in a combat situation, we have eliminated full-time beacons. The survival radio that is being used in combat and tactical situations today is the PRC-112 radio. It was perhaps most notably used by Captain Scott O'Grady while evading in Bosnia. Certain upgrades to the radio have already been made and its successor is in the works. Still, you are very likely to find PRC-90s stateside where we fly peacetime operations. This will remain true for many years. Another extremely widely deployed UHF-only beacon is the URT-33 series of beacons. Most of these are designed to automatically transmit upon opening of a parachute. There are no training versions of this beacon. The beacon transmits on 243.0 MHz only. If you don't know how to DF on UHF, you won't be able to find this beacon. To conclude, it is reccommended that you equip your little L-Per with 243.55 MHz and 251.9 MHz. That way you can train on UHF! I have added these frequencies to my personal L-Per. Additionally, it is a great idea to equip aircraft with 251.9 and 282.8 MHz. Practice vectoring by a survivor. Again, these crystals are all available from L-Tronics! Happy Hunting!